My obsession with multi-colored pendant lights has passed, mainly because a pendant light won't work in the area we need a new light. 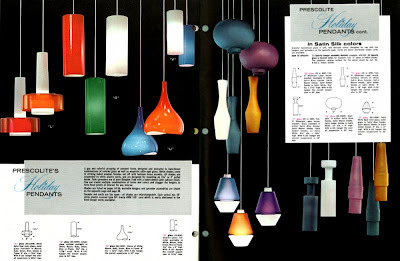 But that doesn't mean I won't share pics of gorgeous mid-century pendant lights when I run across them. For example, these Prescolite Holiday pendants. A gay and colorful grouping of pendant forms designed and executed in hand-blown combinations of colored glass as well as exquisite satin opal glass. Metal shades come in striking baked enamel finishes set off with lustrous brass accents. All shades are suspended by white plastic cords, and are designed for mounting on 3.75" or 4" outlet boxes. Teak spreaders are of pure Bangkok Teak with a hand-rubbed satin cabinet finish. You can create multiple combinations of forms and colors and stagger the heights to form focal points of interest for any interior. OMG...I'm in love with the orange and blue ones just to the left of center of the picture.